Ever wonder why web pages look the way they do? To answer that question, we need to look to the past—1440 A.D., to be exact. When Gutenberg created the printing press, it was suddenly possible to print and distribute thousands of copies of written material, all typeset so that the letters lined up perfectly every time. Since then, the way we read text—including online—has changed very little. But that doesn’t mean it hasn’t evolved at all. When I was living in Japan in the 90s, for example, everyone read the newspaper on the train. Japanese newspapers, unlike the papers you find in the U.S., are designed to be folded in half as you read because the trains are so crowded. You couldn’t open a Wall Street Journal arm-to-arm on the train in Tokyo because there simply wasn’t enough physical space. But today, the way we consume content is not restricted in that way. We’re much more likely to read the news on our smartphones and laptops. Instead of holding the physical paper in our hands, we scroll away on phones or tablets. But we’re still attached to some old-school tactics that make less sense today. Things like above-the-fold, which is a vestige of newspapers that were folded once they hit the stands so that only the top half of the paper was visible to the passers-by. This basic format remains the same for digital content, but it no longer serves much of a purpose. Since the advent of the printing press, technology has enabled us to deliver more content more quickly to more people than ever before. As digital technology continues to evolve at an increasingly rapid pace, it’s time authors and publishers rethink how we present digital content. Just as a Japanese newspaper was designed to create the optimum experience for reading on the train, we have to evolve the way we present online content to give users the best experience. It’s time to ditch trees, categories, menus, and the like. Navigation is among the most important elements of web design. The original navigation favorite was the tree structure, which was popularized with the explosion of Yahoo and its original navigation. It presents a hierarchical view of information, in which each item (or “branch”) leading to a number of subitems. Any branch can be expanded to reveal subitems, or collapsed to hide subitems. However, with the rise of mobile devices, the once common tree structure is falling out of favor. Designers are creating new and improved ways of navigating websites. They have stopped. forcing users to navigate a tree, a giant list of categories, or even think of search terms. Instead, they are thinking of ways to create a digital user experience that is responsive in real-time. Just as Google’s search engine rendered Yahoo’s original navigation approach obsolete, AI is pushing out traditional web navigation. An AI-driven site design that can pick up on and infer user signals and direct them accordingly is much more user-friendly. Before long, all websites will be creating menus, landing pages, and content generated dynamically in response to user understanding. Ideally, prebuilt navigation should be as streamlined and minimalist as possible. When done right, it allows users to open your website or app and find what they’re looking for instantly. Otherwise, users will become frustrated and sign off—and that’s the last thing you want. User engagement is at stake. Today’s consumers are less patient than ever. Today’s customers expect instant gratification. They want to be met where they are, with an article or product recommendation that’s relevant for them at that exact moment, regardless of the channel or device in use. Real-time customer engagement requires knowledge of past purchases, specific preferences, and situational context to make instant recommendations. Without it, your customers will go elsewhere. Data shows that modern real-time companies that embrace this type of real-time responsiveness see double or triple level of user engagement. If it’s a content site, that means up to three times more people watching videos or reading articles, or becoming paid subscribers. On a product site, it means tripling the number of people buying your stuff. If you’re not leveraging AI to give users a better experience already, you’re leaving money on the table and users in the dark. Soon, it won’t be enough to just show users a few options based on past purchases. The next iteration of digital experiences is content presented based on behavioral and external cues. Rappi, or what I like to call “the Uber Eats of Latin America,” is a great example of this next generation UX and a customer of my company, Liftigniter. The app determines what you’re interested in eating and delivers it to your door—whether it’s a four-course meal prepared by a restaurant, fast food takeout, or ingredients delivered from a grocery store for you to cook on your own. They use our AI engine to make individual determinations based on such signals as users’ behavior in their app. It understands what devices they’re using, where they are, and what time of day it is. Using this information, they can make behavioral and environmental inferences. This allows them to determine whether you’re interested in something healthy or comforting, quick or slow, fancy or casual. When it’s cold out, they’ll suggest even suggest a warm holiday soup. If you can create a website or some sort of digital experience that can determine the user interests without them telling you, why wouldn’t you? The only conceivable reason is habit. It’s natural—and easy—to cling to the status quo. However, the printing press no longer reigns supreme. And it”s time online publishers shake off the vestiges of an archaic user experience. After a two-year grace period to allow time for preparation, GDPR finally goes into effect this week. For most enterprises, mapping and remediation of private data storage has been the focus. But now it is time to focus on sustainable operational compliance starting on May 26th and continuing for years into the future. If you monetize with programmatic ads, we’ll assume that your legal team has made the (very typical) decision that “consent” is the best legal basis for processing data under GDPR. Regardless of which basis you choose, data subjects must be given a clear and understandable explanation of what data you will use, how you’ll protect it, who you will share it with, and how long you’ll keep it. When the user gives his (now “informed”) consent, a transparent, trusting, ongoing relationship is formed – exactly what the authors of the GDPR intended. Because it can be revoked at any time, and processing must stop when it is, consent must now be easily checkable by both internal company activities, and also by third parties (called “Data Processors” in GDPR lingo) that utilize the data (for example, ad networks). Clearly, “consent” has become a very important new corporate asset. The AdTech industry has realized that under GDPR, lack of consent could quickly lead to the end of programmatic ads. Last November, the IAB trade group proposed the Transparency Consent Framework (TCF), an open source consent solution that it believes will allow the ads to keep flowing. Many observers, (including DCN) have criticized it for technical and functional shortcomings. The purpose of this post is not to dissect the flaws of the IAB TCF. My goal is to make clear that even if it worked properly, the IAB’s solution could never be considered a complete consent solution for a publisher. Its only purpose is allowing programmatic ads to continue to flow. As this point, you may think “So, what? It will keep my ads running. Why not use a free solution to manage the programmatic ad part of the GDPR consent puzzle?” I submit that consent needs to be handled centrally as a key corporate asset, just like accounting, HR, strategic, and other corporate data. Here is a real-world example illustrating what will happen when consent is not handled centrally. A mid-sized publisher runs ads (of course) but also offers newsletters, email-based promotions with sign-ups, and an affinity / personalization program with a persistent login. If the publisher chooses the IAB TCF solution to run ads, they still have no solution for storing or managing user consent to their internal GDPR uses. (This could include email newsletters and affinity programs, but potentially many more. Today’s digital marketing creates a lot of data ingress points). The publisher chooses a “GDPR compliant” third party email provider that gathers consent and stores it internally (not accessible to publisher). For their affinity system, the publisher creates a basic consent flag system on their internal servers. In theory, the publisher is now covered for GPDR consent. In actual practice, this “patchwork” solution is very unpleasant for users. They will be interrupted and asked for their consent for ads the first time they come to the site post-GDPR. They will again be interrupted and asked for consent (by a different vendor and with a different UX) when they join the email list. Then, they will again be interrupted and asked for their consent with a different UX when they join the affinity program. It gets worse. Under this patchwork, when a user decides to revoke or modify their consent, their path to success is extremely arduous (the opposite of GDPR’s “easy as giving consent” wording in Article 7). Since the IAB TCF does not provide any user interactivity, the publisher must use an IAB approved Consent Management Platform (CMP) to provide users with required rights management capability. 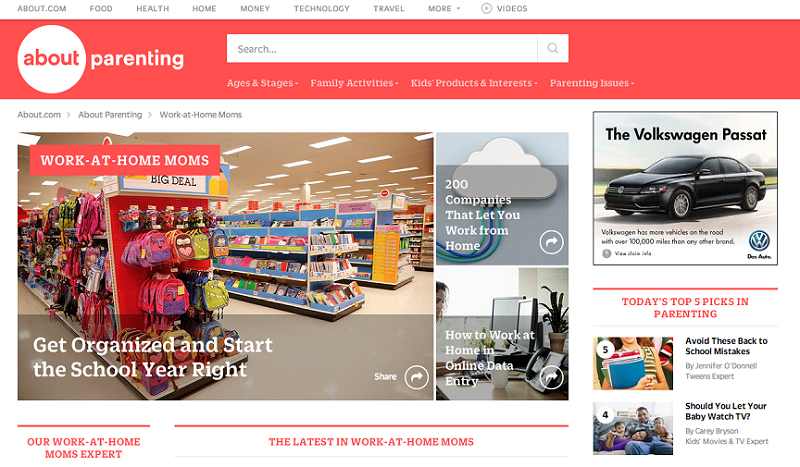 To modify their ad consent, users must use the CMP dashboard that the publisher has chosen. To revoke email permissions, the user would have to visit the “unsubscribe” page of the email vendor. Finally, for the loyalty program, they would need to use a “revoke my consent” function from the publisher’s in-house consent manager. Consent fragmentation is the result of using different “Band-Aid” systems to hold user consent, and there is no positive aspect to it. This situation came about because the publisher did not understand the true importance of consent. No publisher would ever hold separate general accounting ledgers in multiple unconnected silos. It would be a certain recipe for disaster. This disconnected experience is bad enough for a single site. Now imagine how users will feel if most sites ask their consent three or four times. This is the nightmare scenario that risks the failure of GDPR because users will simply stop giving consent. With a single consent repository, users are presented with the experience they expect: one single sign-on dashboard. It will provide them with an accurate and easy to understand notice of the uses of their private data, easy access to exercise their rights, the ability to selectively opt-in or out of each of the services used by the publisher, and a secure point of access for SAR and breach notification. The solution must be an easy to use, single sign-on privacy management is evidence of “Privacy by Design,” as envisioned by the authors of GDPR. 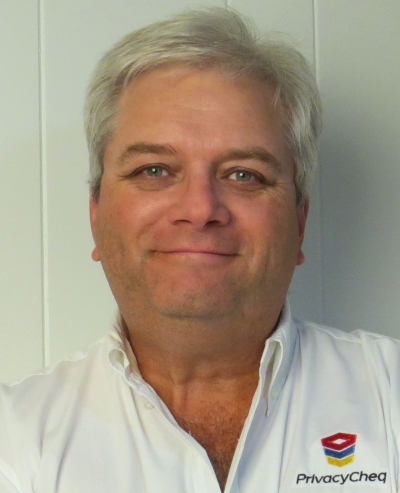 Roy Smith is founder and CEO of PrivacyCheq, a leading provider of SaaS privacy compliance services to enterprises and small business worldwide. People are more connected that ever. And they also demand to be heard. They hunger for experiences that are genuine. Companies must show they listen and care, and cultivating these capabilities is at the center of Empathy Marketing. A great example is finance, which has seen a massive decline in consumer trust and brand love. 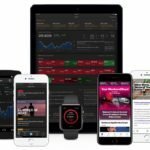 Mobile fintech apps and startups are gaining traction with the help of approaches that show they understand what their audience want and are sincere about helping them to achieve life goals. It starts with something as simple as imagery that is inclusive. For example: showcasing women in campaigns creatives and empowering them with the feeling they can take control of their financial future. Effective assets and advertising demonstrate traits women value most (trustworthiness, dependability, and accessibility). Companies can adapt these key takeaways to power approaches that drive consumer connection and deepen trust. As the saying goes: Actions speak louder than words. This is a connected age where consumer crave authenticity. So, companies must use everything they know about their audience to deliver experiences that address needs, anticipate interests, or simply go the distance to make their life better. Anything less shows disregard for the individual and tells consumers you’re not listening, or worse, you simply don’t care. Defining audience engagement can feel daunting at times. In our work at Harvard Business Review, we’re looking at engagement – and experimenting to understand that engagement better – through several different lenses: What is most valuable to current subscribers or potential subscribers or social audiences? And what formats hold the most growth potential across social, text, audio, video, bots, and so on. 1. When doing something brand new, get (at least a few) true believers in the mix. Like others, we barreled into doing Facebook Live videos in early 2016. We weren’t doing much live video on the editorial side at the time, but we had a few ideas about what would work and what wouldn’t. We were especially eager to try videos that allowed the experts who write for HBR to explain their ideas to the audience directly. 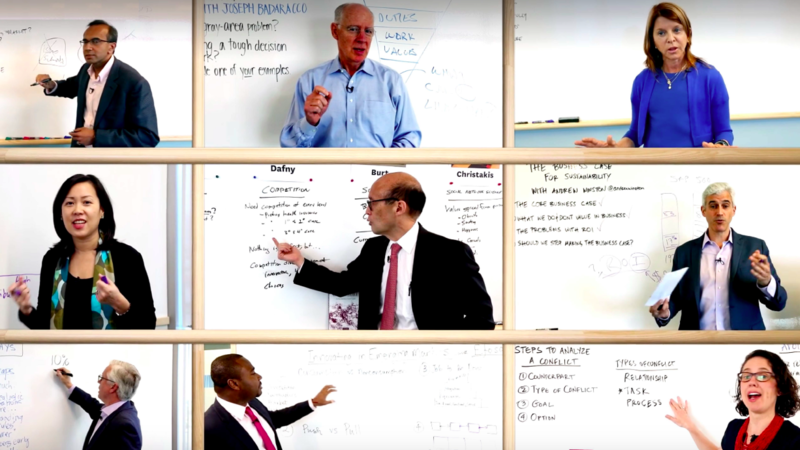 These videos, called whiteboard sessions, put a professor or business leader or other expert in front of a camera (or, early on, in front of a phone) to talk about their idea or concept for up to 40 minutes. We knew this format would be fairly natural to the presenters because they know how to lecture or give presentations. That gave us a constant point of quality and allowed us to focus on the engagement side: questions, comments, visuals, takeaways. However, while we had confidence in the format, we needed to work on getting the audience to engage. We discovered the importance of enthusiastic presenters. We had a few early on on who really believed in the opportunities that live, social video offered. One of those early whiteboard experts was entrepreneur and author Evan Baehr. He immediately understood the challenges: a live audience, a social platform, and a lot of competition for your attention from other content. But his enthusiasm got the audience’s attention right away and gave us a glimpse of what was possible with this format. That confidence in the whiteboard format has been part of what has led us produce and experiment with more than 100 live whiteboards with experts from all over the world. We’re now working on creating a larger video strategy for them. But without the enthusiasm of people like Evan and others early in the process, we might have assumed whiteboards were a nice-to-have and not invested our time as purposefully. So, keep in mind that, when you’re trying something new, you need to make sure you have some enthusiasts in the mix. The audience can feel it when you’re not enthusiastic about a medium (especially when it comes to video and audio), which will be reflected in popularity and engagement. 2. Text interactions can be tricky. While we often seen hundreds of comments and shares on live videos, our results have been somewhat mixed when it’s come to text-based chats. We write about a lot of work advice that’s very personal and a lot of business trends that are important to understand. We know that connecting our audience – and specifically our subscribers – to the experts who write for us helps people go even deeper in applying and sharing these ideas. We’ve tried text-based engagement experiments around this premise in a couple of ways. In one open-to-all experiment around an important feature piece (an article series we call the Big Idea) on inequality between firms, we invited readers to a Slack channel where the author of the main piece was going to be available for questions and conversation about his research and work. We thought this had the right combination of platform plus deep, important topic and timely relevance. The results were mixed. While we had more than 150 readers join the Slack channel, they mostly lurked. It’s tough to diagnose why. Was the text format intimidating? Too much work? Do people really want to listen to an expert first and foremost? We’ve also tried this type of experiment in subscriber-only settings. We’ve invited authors of HBR pieces to answer questions in a closed Facebook group for subscribers, for example. The results have often been similar. Most people lurk and don’t contribute much. We’ll keep experimenting with this type of engagement. But we may need to pair text chat with something else – like video or audio – to really stir interaction. And we need to keep considering the right platform, as well as how much people want to interact with each other instead of an editor or author from HBR. 3. Constantly test your assumptions. A central tenet of HBR’s experimentation and innovation practice is to write down our assumptions, goals, and hypotheses. This document is shared between product, editorial, and other teams involved in the project. We then check back on those assumptions at planned intervals to understand what we should do differently, what we’ve learned, and to help gauge whether the experiment should continue. We’ve done two bot projects, one on Slack and one on Facebook Messenger, that help illustrate how this works. When we started the HBR bot on Slack, we assumed that people would love to see our big beautiful images in their conversations with our bot. However, our UX research proved that was wrong. People just wanted to get to work advice we were offering. We also hypothesized that we wouldn’t drive any trackable subscriptions through the bot. That was right. But we also believed in driving frequent interactions through the bot should lead them to engage more deeply with us, even if we can’t draw a straight line back to their bot experience. That engagement could take a lot of shapes: Signing up for a newsletter, following a social channel, sharing an article with a friend. It helps to write down even your most basic assumptions. For our recent Women at Work pop-up podcast, we documented the assumption that people wanted to engage with HBR about this topic in an audio experience. For the bots, we had to test our assumptions that people wanted to consume our content in bot form (and we’re still testing whether that’s true). It seems basic, but doing these things helps your build up a store of observations that can inform your future experiment plans and pitches. 4. Be clear on asks to your audience. Don’t take this one for granted. When you ask your audience to do something, have a purpose and follow through. HBR has had a subscriber-only Facebook group for about a year now. The editor who runs it, my colleague Laura Amico, is clear that when editors post to that group, there’s a purpose and a plan. We’re not just throwing out a “What do you think?” to that community and walking away. Instead, we’re asking that community to join us in testing advice or sharing ideas on how they’ve solved tough work problems. We’re also opening up new channels to listen to our audience and incorporate their feedback. Our new Dear HBR: podcast answers questions from the audience about tough workplace dilemmas. It’s our newest foray into the advice space, and we’re already seeing steady growth in the number of questions being posed. Comments are about so much more than what is typed into a text box. Commenters need to know how to succeed in what we’re asking them to do and they need to be rewarded for doing it. That’s true on the other side, too; editors and others working with audience development also need to know how they and the business benefit from engagement. Developing use cases for comments, promoting good comments, and sharing engagement results internally and externally are all key to maintaining the relationships. As we move into new areas of experimentation around engagement – involving everything from email to comments to visual storytelling to machine learning – we’ll keep testing our assumptions. We’ll keep pushing ourselves to think dynamically about our audience and how we ask for their time. And hopefully we’ll make their day at work a little better, too. Maureen Hoch is Editor of HBR.org. Hoch leads Harvard Business Review’s digital newsroom and oversees the team working on HBR’s Facebook Live videos. She played an instrumental role in the redesign of HBR.org, which has since garnered three Webbys, and she helped lead the team that created HBR’s bots on Slack and Facebook Messenger. Hoch joined HBR as Senior Editor in 2013. She has previously worked for the PBS NewsHour, the World Bank, and The Washington Post Express. News UK, whose brands include The Times, The Sunday Times, and The Sun newspapers as well as social video ad platform Unruly, has opened the doors of its new vertical video studio. The new V-Studio, which sits in News UK’s commercial division The Bridge, is a bid to boost the amount and quality of video on News UK-owned properties and elsewhere on the Web. Naturally, V-Studio will both create vertical video advertising for its clients to distribute via its owned properties and platforms. However, it will also allow those same clients (for a fee) to distribute the mobile optimized videos across the Web. The approach has raised concerns the vertical video studio aims to take on full-service digital agencies. However, while V-Studio certainly has the capabilities to do so, Milton Elias, head of mobile and video at News UK, says the strategy is to create, not compete. It’s all about producing “better video, better inventory and better engagement” to monetize an audience that has become “by default mobile-first,” he explains. Data that shows 91% of readers accessed The Sun newspaper on their mobile device in April, compared with 82% for The Times News UK. What’s more, The Sun also counted 8.7 million video views in the same month. “Monetizing audiences and delivering a great user experience requires mobile video that has been created for mobile. That means thinking vertically,” Elias says. Easier said than done in a market where many brands somehow believe they can simply squeeze TV ads and assets onto a smaller screen, regardless of the user experience. “Effective mobile advertising needs video that was created for consumption on that device and fit for that purpose,” he adds. This is where V-Studio comes in “offering clients and brands a canvas they can use to create vertical video assets seamlessly,” he explains. Less than a week after launch, Elias says the studio already boasts a “well-known luxry brand” as its first client, with more in the pipeline. The top priority is to drive better results through higher engagement. The goal will be to enhance, rather than interrupt, the user experience. The seven video formats currently produced by the studio sit in the mobile scrolling flow, where users can choose to click on videos, or simply scroll past them. Another focus of the V-Studio launch is harnessing News UK first party-data and touch points around content users engage with. This will allow marketers order to hone audience targeting and advertising relevancy . “In the beginning we’re selling them [ads] on a direct buy basis and we’re hoping to make that available on a programmatic guaranteed basis,” Elias says. As he points out, the industry has seen a fundamental shift in how people consume media, particularly via mobile channels. Given that so much of today’s high impact ads are created for consumption on large horizontal screens, News UK wants to lead the charge in optimizing marketing messages for mobile engagement on its sites, and across the web. Peggy Anne Salz is the Content Marketing Strategist and Chief Analyst of Mobile Groove, a top 50 influential technology site providing custom research to the global mobile industry and consulting to tech startups. Full disclosure: She is a frequent contributor to Forbes on the topic of mobile marketing, engagement and apps. Her work also regularly appears in a range of publications from Venture Beat to Harvard Business Review. Peggy is a top 30 Mobile Marketing influencer and a nine-time author based in Europe. Follow her @peggyanne. Does improving page load time positively impact readership? Google’s Accelerated Mobile Pages (AMP) project was launched in February 2016 to address both the increasing bloat of web pages and the subsequent consequences of a diminished user experience for readers, publishers, and advertisers. By creating a platform from which media companies could publish clean, streamlined versions of their articles, AMP promised to speed up the average page load time and make it easier for visitors to stick around and read their content. But how does it deliver on this promise, and what is the impact on consumer engagement? Chartbeat pulled actual consumer behavior data across 360 sites using AMP and FIA from June 2016 to May 2017. 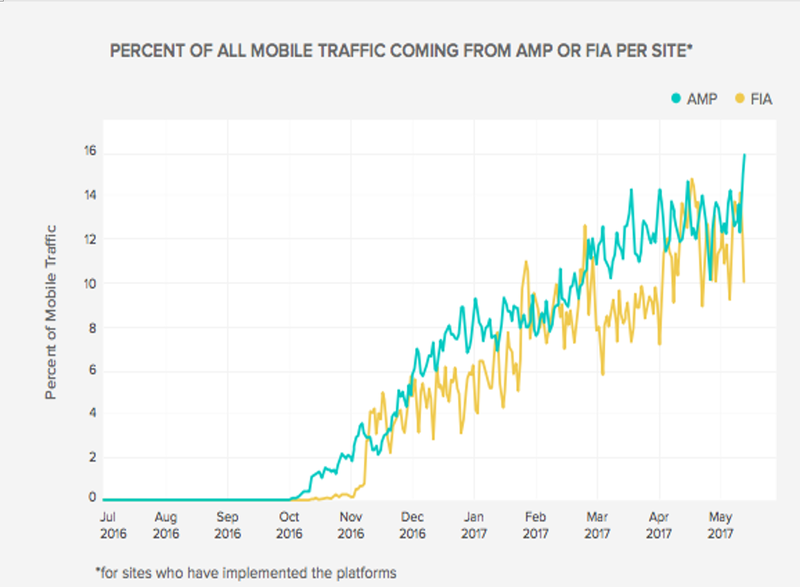 Our research shows that, while usage rates and the subsequent number of articles consumed on each platform differs, it turns out that both AMP and FIA content have been receiving larger and larger shares of publishers’ mobile traffic, and at fairly equal rates. As of mid-May 2017, a typical publisher who implemented AMP saw 16% of all mobile traffic on their AMP content. Comparatively, publishers with FIA saw 14.8% of all mobile traffic on FIA content. These days, web experiences are all about speed. Almost half (47%) of consumers expect a web page to load in 2 seconds or less. Even more significantly, 40% of people abandon a website that takes more than 3 seconds to load, meaning they never reach the published content at all. 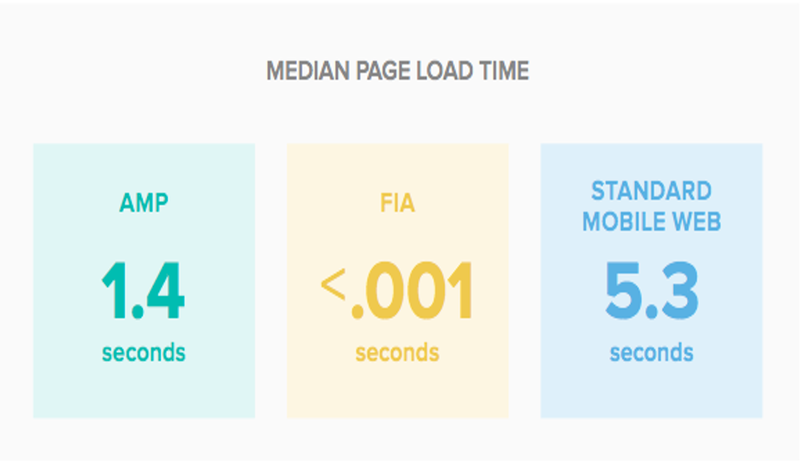 So how are AMP and IA optimizing page load times? Chartbeat analysis shows that AMP loads roughly four times faster than the standard mobile site experience, and Instant Articles load even more quickly. In fact, 88% of Instant Articles load too quickly for us to even register a load time. Now that’s fast. This is a big deal, and proves that both initiatives are delivering on the promise of providing a much quicker load time to improve reader experience. And publishers are seeing the effects — with less time spent waiting for pages to load, consumers have more time freed up for engaging with content. With so many distributed ways of finding content and such short consumer attention spans, every second counts. So how does AMP stack up? Chartbeat’s data shows that readers engage with AMP content for 35% longer than standard mobile web content. 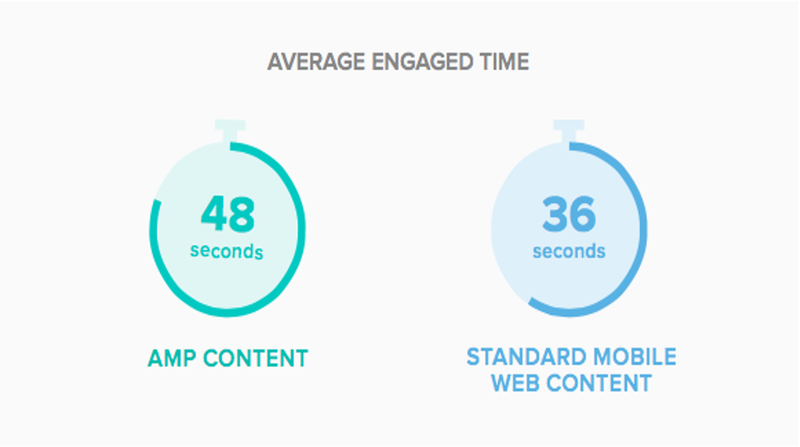 They spend an average of 48 seconds with AMP content vs. 36 seconds with mobile web content when coming from search. The fact that readers are engaging for so much longer than they normally would suggests that user experience really does matter in catching and holding attention. One big question still remains: Will publishers continue to scale their efforts and should these high speed platforms become the mobile industry norm? While the increase in engaged time for publishers who have adopted both AMP and FIA are compelling, the jury is still out on whether the end justifies the means. 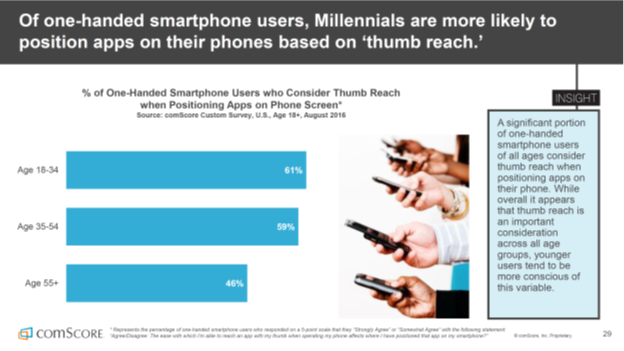 The numbers here demonstrate that consumers clearly value these optimized mobile experiences and this may just be the evidence we need to validate their potential. However, larger questions still remain around each on both publisher value and quality. As publishers continue to use these platforms and readers continue to react, it will be interesting to see how AMP and Facebook IA evolve in the future – possibly in two completely different directions. At the end of the day, visitors deserve a fast, clean, enjoyable reading experience where they spend most of their time – on mobile. And publishers can benefit from a more effective mobile environment where they can distribute and monetize content and scale their success. But at what cost? How can we make this win-win? John Saroff is Chief Executive Officer of Chartbeat, a leading content intelligence platform used by more than 50,000 of the world’s top media properties in over 60 countries. He has worked on the cutting-edge of media and technology for 17+ years, setting the daily operations and business development agendas of companies as diverse as Google, NBC-Universal and vente-privee. John received his undergraduate degree in History from Haverford College and a joint degree in Law and Business from Columbia University. 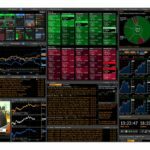 Bloomberg L.P. advances design on multiple fronts through its industry leading products and unique company culture. 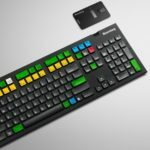 Starting with the groundbreaking design of the original flagship product, the Bloomberg Terminal, the design of media products such as Bloomberg Businessweek and Bloomberg.com, and its innovative work spaces and sophisticated branding programs, design is integral to how the company operates and provides value to customers. Fahd Arshad, head of User Experience (UX) design for financial products, Ali Jeffery, Visual Design Lead for the Bloomberg Professional service, and Mike Mallon, Engineering Manager in Bloomberg’s application toolkits group. ALI JEFFERY: Bloomberg’s design philosophy is to lead, not to follow. We definitely have a very strong opinion and express it in all of the facets of design across Bloomberg. FAHD ARSHAD: Our design ethos is to make sure we are being useful to our customers. Every time we sit down and design something, we start with questions like, “How is this going to help our customers do their jobs?” “Is it going to make them more efficient?” Then, everything else comes from that. It’s a classic case of function over form. And that starts all of our design conversations. When we express a piece of information, it is going to be in your face. We utilize high contrast colors to enable our customers to pick out information from a lot of noise. I would probably argue that this is the hallmark of our design, especially when it comes to the visual aspect of it. MIKE MALLON: We’re aiming for efficiency, trying to make everything fast for the users, but also make it fast and easy to learn new things. Both of those pieces are important. We need to support both our power users and people who are just getting started and aren’t familiar with things yet. 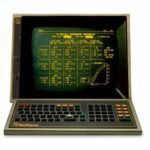 Does Bloomberg have a design hallmark or style? ALI: Definitely, especially with our software. Our black and amber color scheme is our strongest hallmark. You can see it across the trading floor. You know which application is Bloomberg from very far away. Amber is our base font color. A lot of systems you see today will use much more neutral tones. But the amber and black has really become who we are. And it’s something we protect as part of our brand. 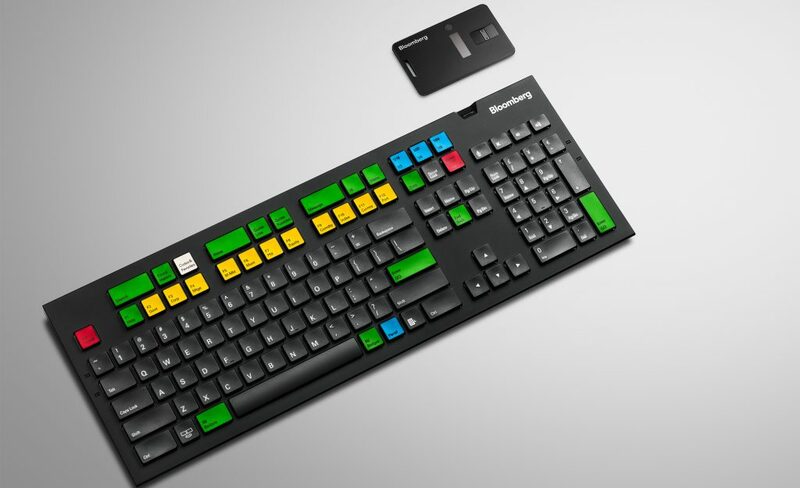 Our keyboard’s yellow keys are also a part of our design presence and our recognizability across a trading floor. 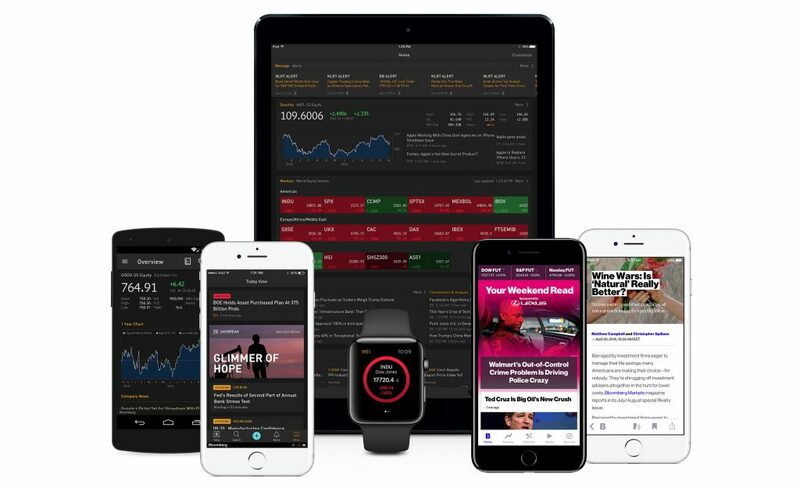 They became a unique feature for Bloomberg and something that we chose to highlight and see as part of our identity. FAHD: The color scheme just became iconic. 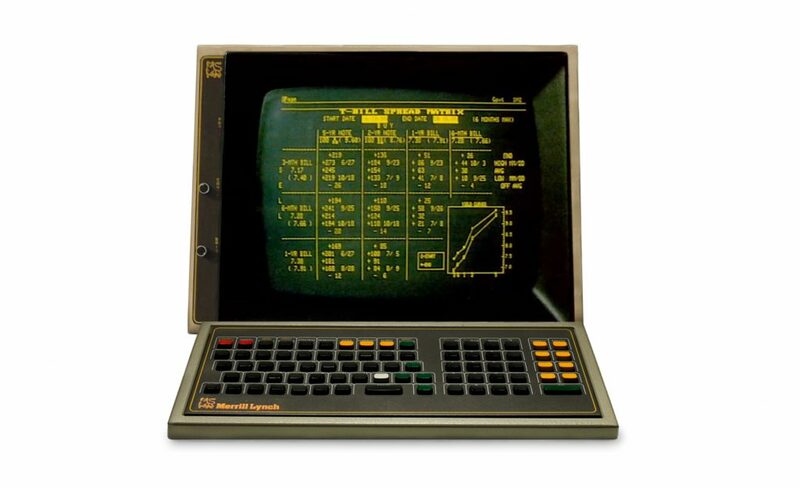 You’d walk onto the floor and you’d see a row of amber and black screens and you knew you were in a Bloomberg shop. It’s interesting how we’ve seen that evolve and some of our competitors have started picking it up. It became sort of the hallmark of being a financial superpower that you had a dark background. But we stayed with it, because that is our hallmark. That is our brand. And our customers love it. How does design apply to your area of focus? ALI: I think one of the things I’m the most proud of working on is the framework of our system. We are creating the building blocks for the rest of the company to design their software. We’re working on making the underlying toolkit that the applications rely on more user-friendly. MIKE: My role is to implement the designs that the UX team comes up within our applications. A big piece of that is figuring out how we can be reactive to new designs. One of the most interesting things we do is bring users into our User Experience Lab and try new things out with them and then react to their feedback. Then, the thing that we actually release will be something that is really useful to actual clients who have tested it out. How is Bloomberg design different from how some other companies might view or articulate design? FAHD: At Bloomberg, we don’t spend a lot of time looking at what other people do. We know what our goal is. We have customers that we need to satisfy. The one big difference I hear from other people is how much we cultivate our relationship with our clients and how willing our clients are to come in and help us improve our products. It’s non-trivial for a portfolio manager or trader who has different time commitments to give us an hour-and-a-half or two hours of their day and to come to our office and sit in the lab. We’re lucky that, as an organization, we have cultivated that amount of loyalty among our customers and that sense of shared mission. Our whole philosophy is about showing all the functionality to the user – that is, making it very accessible, very easy for them to use. This may sometimes lead to screens that look complicated at first glance, and someone might say, “Wow, there’s a lot here.” But what we’re actually doing is putting all of that at the user’s fingertips right away. 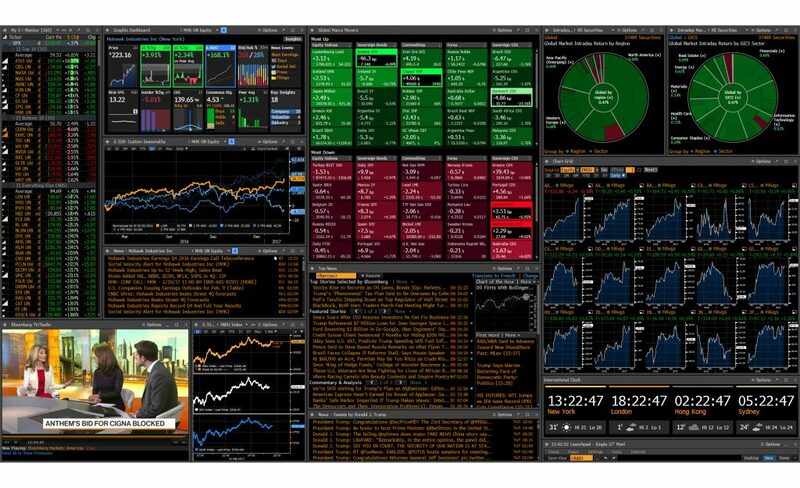 How do Bloomberg’s customers influence design? MIKE: Well, they’re part of the process. We try new things on a bunch of employees first, but then we always bring customers in to try it out before we actually build something and turn it into a product. This way, we actually know that what we’re building is valuable to them. FAHD: We take whatever our hypothesis is, we talk to the subject matter experts and we express our findings as early designs. But we try and validate them with our customers, because our end goal is being purposeful in our designs and providing value to our customers. A big part of the design process is all working towards a single understanding – talking to our customers, understanding their needs and then designing to them. Since our sales force is constantly in touch with them, we get a lot of feedback. This has caused us to really evolve our product. We have an underlying technology infrastructure that allows us to push new software out to our clients very quickly, so we’re able to react to any of their needs. It’s actually really beneficial for our clients. 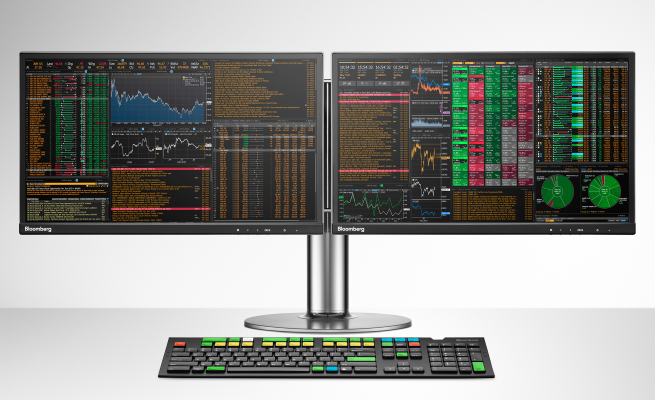 Bloomberg was founded on bringing transparency to financial markets, how is that principle reflected in Bloomberg’s design? ALI: We really never design for design’s sake. It’s always meant to address our customer’s needs. We’re trying to create a clear hierarchy. We’re trying to make sure that they can find and parse information as quickly as possible. MIKE: I think transparency is very important in how we do design. One way we show transparency is by showing clients ahead of time what it is we’re going to build. Another way that we’re very transparent is we try to release our designs across the whole Terminal. So, all customers get access to the same designs. They all get access to the same types of things. And we’re very transparent in that we’re releasing these different features to all our clients at the same time. Everyone gets the same benefit. And we keep them in the loop on what we’re doing and why we’re doing it. FAHD: Today, there is such a wealth of data that people are drowning in it. The important part is not having access to data, necessarily, but paying attention to the right amount of data or the right kind of data. And that’s what I personally see as the definition of transparency today: surfacing what you need to know, when you need to know it, and why this is relevant to you. The goal of our design process has to be to make our customers more efficient and more productive. If we keep doing that, we will continue to bring value to them and be useful to them. And that’s where we will continue to be successful. Note: This interview is reprinted with permission from the Tech at Bloomberg blog. 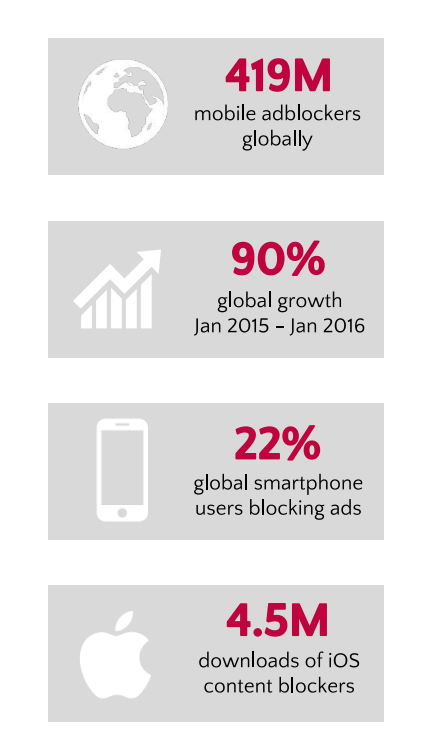 Mobile ad blocking on the rise. What’s that mean for digital publishers? Ad blocking on desktop has been a thorn in the side of publishers for years, but it’s the advance of ad blocking on mobile and built into browsers – and the stunning growth trajectory of ad blocking usage across markets including China and India – that poses the greatest threat to digital media companies that depend on advertising for revenue. This is the key takeaway of Adblocking Goes Mobile, a recent report published by Page Fair, a company working to mitigate ad blocking with the help of technology it claims addresses the speed, privacy, and UX issues that cause ad blocking in the first place. Drawing from research and analysis of ad blocking browsers and capabilities conducted in collaboration with app intelligence firm Priori Data, the report sheds important light on the factors driving the meteoric growth ad blocking around the globe. To date the report points out that “at least 419 million people are blocking ads on smartphones.” That’s nearly twice the number of consumers blocking ads on desktops and PCs. Do the math, and 22% of the world’s 1.9 billion smartphone users are blocking ads on the mobile Web. While mobile ad blocking browsers have become a mainstream technology, there are important differences in how and where consumers block ads in their content and news. Ad blocking usage in North America and Europe is not as widespread, thanks to developed mobile data infrastructure and affordable data plans. But there are also distinct differences. Ad blocking browsers are popular in Europe, while content blocking apps (apps that block ads in web pages viewed via a Safari browser on Apple’s iOS 9 Apple devices, for example) are 3x more popular in North America than in Europe. In total (as of March 2016) the report reckons there were 14 million monthly active users of ad blocking browsers in Europe and North America. In total, 4.9 million content blocking and in-app ad blocking apps were downloaded from app stores in Europe and North America since September 2014. 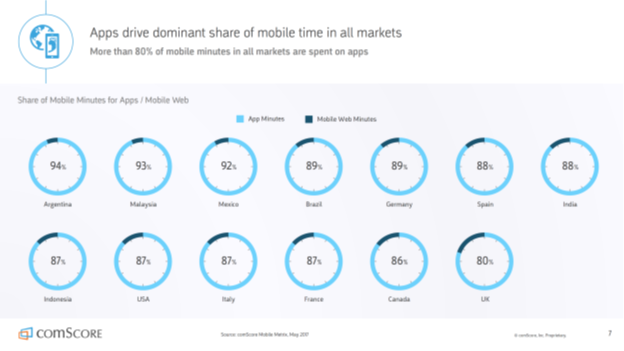 The mature mobile markets of North America and Europe are marked by slow, but steady adoption of ad blocking browsers and content blocking apps. It’s the calm before the storm as the range of ad blocking tech continues on an impressive growth trajectory. The report identified an incredible 229 different content blocking apps on Apple iOS alone. Expect the numbers to skyrocket now that Samsung will make good on its promise that the default browser on its Android devices will support its version of content blocking. Growth of ad blocking tech will also see a huge boost as more browsers (not just operating systems) add ad blocking support and make it easier for consumers to configure their preferences. It’s important to have a report that draws from empirical data, not user surveys, to understand the increasingly complex landscape of mobile ad blocking technology. Now it’s up to the media and publishing industry to use this report as a starting point to address the root causes and issues that are convincing consumer to use adblockers in the first place. Fortunately, the report takes the first steps, inviting industry leaders and associations – including Digital Content Next – to weigh in with their opinions on the rise of ad blocking technology and why a focus on delivering a better user/reader advertising experience should be top of mind with all digital media companies and brands. Though the vertical landing pages and article templates are very similar at launch, according to Colbert over time they will begin to look more distinct. “The Money section will include rate tables and stock tickers; each will feel like their endemic brethren,” he said. The objective is to become less reliant on search to drive the site’s traffic and to become a place that enthusiasts and information-seekers routinely rely on. This data focus will also help About.com better monetize its audience by offering advertisers a better context for their messages so that they can be included on areas of the site where one might not immediately think to look – essentially in-house behavioral targeting.